The U.S. Gypsum Company introduced drywall in the early 1900s, but its use didn't become widespread until the postwar housing boom in the 1950s. Consequently, it isn't unusual for older houses to have lath-and-plaster walls, and you often see repairs to these walls executed with drywall. Drywall mud and wall plaster are similar materials. The US. Gypsum Company introduced drywall in the early 1900s, but its use didn't become widespread until the postwar housing boom in the 1950s. Consequently, it isn't unusual for older houses to have lath-and-plaster walls, and you often see repairs to these walls executed with drywall. The biggest issue when combining these two materials is handling the transition between them. Drywall joint compound has enough similarity to plaster, however, to make transitioning easy. 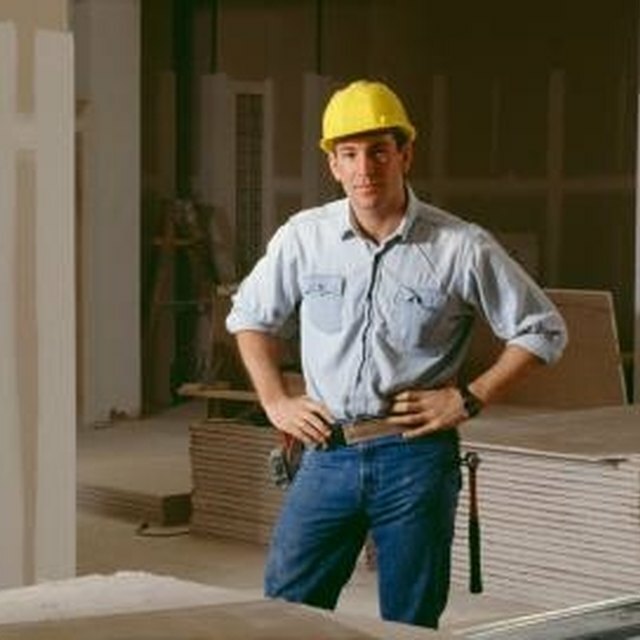 Before drywall became popular, lath and plaster was the most common interior wall covering in American buildings. To plaster a wall, a builder nailed wooden lath to the framing, covered it with wire mesh and troweled on the plaster in several coats. Drywall, on the other hand, requires no base material, and builders can attach it directly to the framing. They must then cover the seams between drywall sheets with tape and drywall joint compound, or mud. All-purpose mud has the same consistency as plaster, but it doesn't dry as hard. On the other hand, setting-type mud, or hot mud, does dry as hard as plaster. The main problem you encounter when using drywall to patch a plaster wall is that the combination of lath, mesh and plaster is usually thicker than the drywall. The solution is to shim out the drywall so it's flush with the plaster surface. Establishing the right thickness for the shims may take some trial and error, but once you've done that, you can rip the shims on a tablesaw. the framing in a plaster wall isn't spaced to accept drywall, so you may have to add some blocking or extra studs in order to have surfaces to which to attach the edges of the sheets. When patching plaster, it's important to make sure that all material you leaving on the wall is solid and won't chip off. Before installing the drywall, preparing the plaster edges by beveling them prevents bumps from forming under the tape. Hot mud is more stable than the all-purpose variety and is the better material to use for undercoating the tape. You must carefully scrape hot mud flat before it dries, however, because it is difficult to sand after it sets. Once the mud sets, the joint needs two to three topcoats of mud, just like a regular drywall seam. The paper surface of drywall is different than a plaster surface, and the difference is likely to be noticeable unless you apply a texture to both surfaces. Skim-coating with all-purpose joint compound is an effective way to blend the two materials. To skim coat, you lay a thin coat of mud on the entire wall and scrape it flat with a drywall knife. Another way to match the surfaces is to roll dilute mud on the wall with a paint roller to create a mottled texture. A third way is to spray diluted mud with a hand sprayer and flatten the mud with a drywall knife.